Budding photographer Chris Dorley-Brown had decided to stroll into the City of London in the hope of grabbing some images of the Rolls Royce Holdings (the aero-engines bit) privatisation that took place that day. In 1987, as now, it doesn’t take much to create traffic chaos in that part of town and Dorley-Brown, being something of a car guy, started snapping the grid-locked drivers. ‘They were sitting ducks’. So this book, out on Martin Usborne’s imprint Hoxton Mini Press, is a snapshot, a section through a particular part of London on a particular day. It’s street photography in the sense that all the cars and trucks and vans are on the street and all the drivers and passengers are inside them. Including a toddler who appears to be driving a Ford Sierra across London Bridge (but probably isn’t). 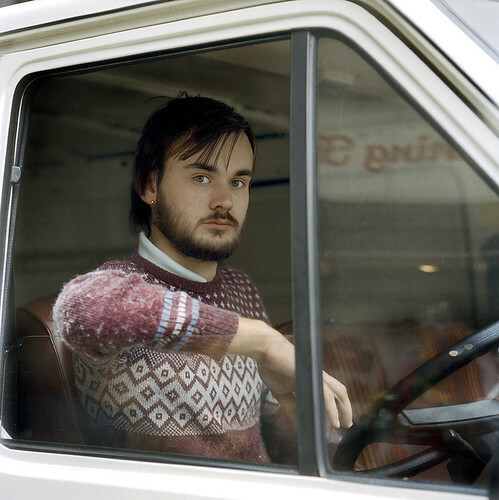 There are a lot of relatively pissed-off looking men in work-related vehicles, vans, trucks, taxis and couriers. Do the same route today and I’m sure they’d all still be there, just with updated vehicles and hair. Actually maybe not hair. 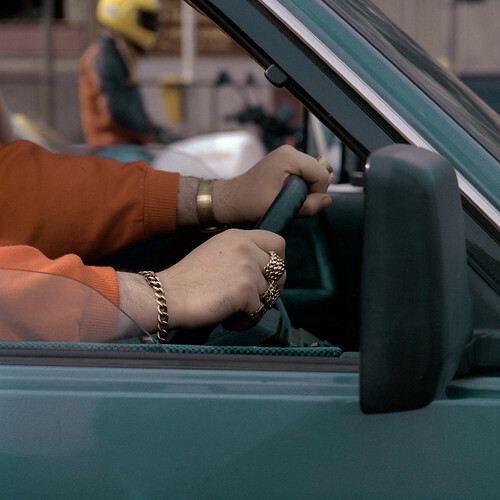 There’s a man drinking a McDonald’s milkshake while at the wheel of a Peugeot 604. Those cars had velour upholstery, so I really hope he didn’t spill any. There’s a Peugeot 505 (mis-captioned as a 305) that appears to be in service as a mini-cab. There are savage dents in the driver’s and rear passenger’s doors that are upsetting – it would have been a relatively new car in 1987. And it was designed by Pininfarina. Pictures of random people in cars always beg questions. How did that particular person end up driving that particular car. Did the woman in a Renault 30 on Mare Street choose that model in that colour? With those stripes? 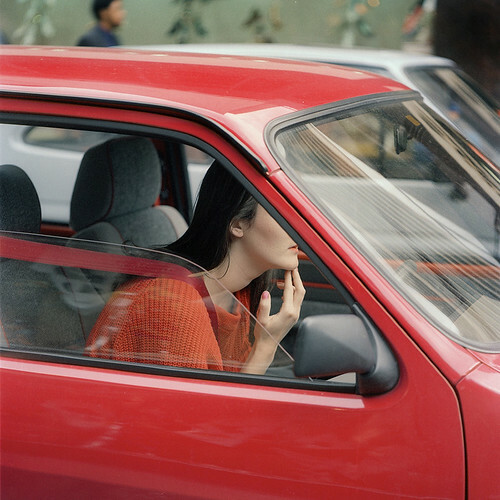 Did the woman with the red lipstick and nails in a matching red MG Metro pick out the exact spec of her car? MG Metro, Norton Folgate, London EC2. Top: Austin Maestro City Van, London Bridge, EC4. 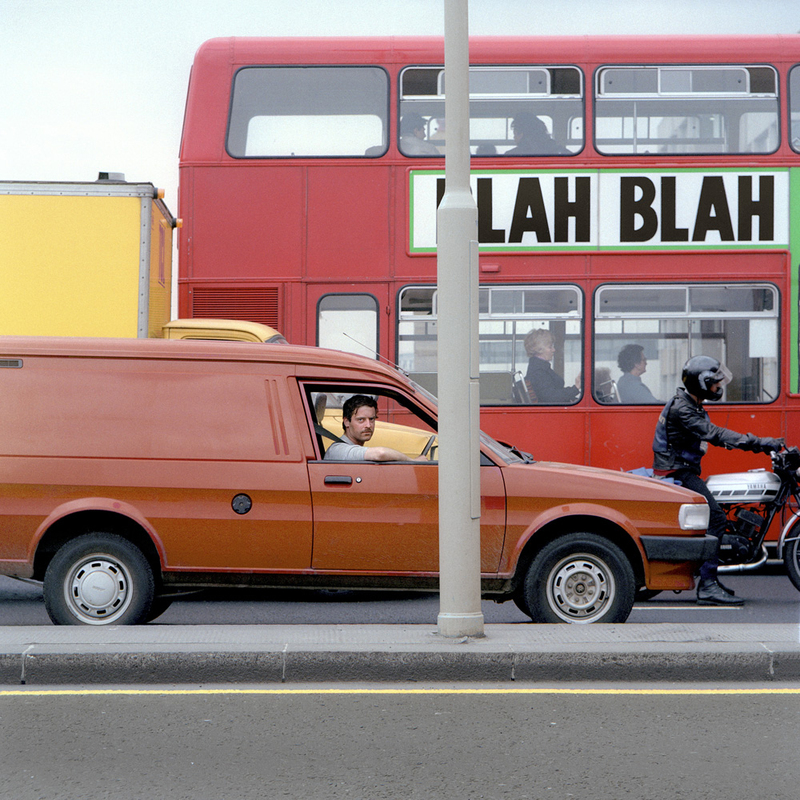 All photos by Chris Dorley-Brown, taken on a Rolleiflex camera one day in 1987. I have to mention the Mercedes W115. This was the last stacked headlamp car Mercedes made, styled by Paul Bracq, a classic three-box design. It was about fifteen years old in 1987, as it is the model with front quarter-light windows. It’s looking a bit rusty (not an uncommon problem with the W114/115) but someone has seen fit to give it a ‘paint-job’ so what I imagine to be the original cream (classic W115 colour) has been supplemented with a dark reddish brown below the belt-line and on the roof. The driver is holding a cigarette out the window. If he was responsible for the colour scheme I’d have had him arrested. If you tried the same project today there wouldn’t be so many people smoking. They would be on their phones instead. But otherwise not much would have changed, which is why this little book is so fascinating. It’s a diverting bit of time-travel that – like the grid-locked cars – doesn’t really take you anywhere. The Knowledge. 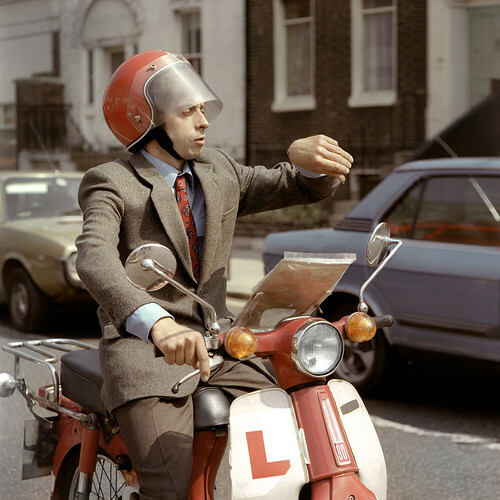 Honda 90 Moped, Mare Street, Hackney, London E8. 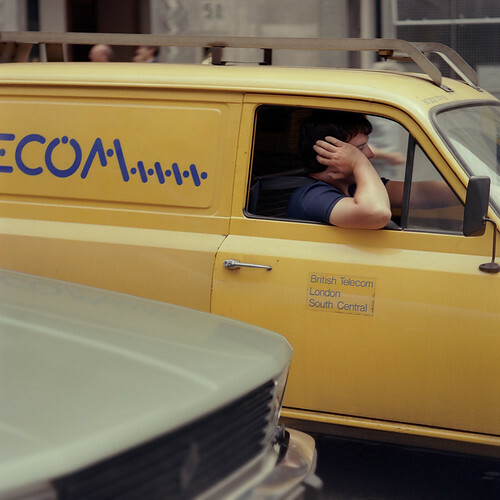 British Telecom van, with livery designed by Banks & Miles. The company had been privatised earlier in the 1980s. 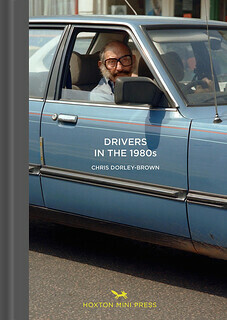 Cover of Drivers in the 1980s by Chris Dorley-Brown featuring a Cortina Mk5 Crusader on Mare Street, Hackney, London E8. Hoxton Mini Press series design by Bread Collective.